Stephen Covey presents the keynote at the 2018 Ethics First Event Sept. 11. Stephen M.R. 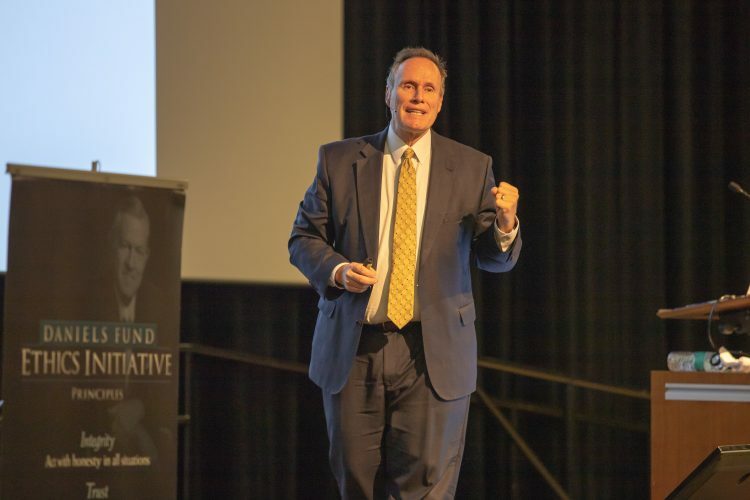 Covey outlined why there is a business case for building a high-trust organization as the keynote speaker at the second annual UCCS Ethics First Event Sept. 11. The bestselling author of “The Speed of Trust” delivered his address titled “Voicing Ethical Values” to a full crowd in Berger Hall. Covey outlined how high-trust organizations are often the most successful in business rankings because of the relationship between speed and costs. In a high-trust environment, employees can often complete projects faster, which ultimately means greater efficiency and lower costs. In a low-trust environment, projects are often done slower because employees often distrust the work of others and cost more over time. Covey cautioned that there are always risk in trust, but often there are greater risks in not trusting. Each attendee received trust action cards, which outlined Covey’s five waves of trust, the four cores of credibility and his 13 behaviors of high trust. People were encouraged to pick one core and three behaviors to work on improving in the future. Covey answered questions before the event moved into a workshop on techniques for acting on ethical values. Ethics First is managed by the UCCS Office of Compliance and sponsored by the Daniels Fund Ethics Initiative at the UCCS College of Business.